Lock in a great price for Holiday Inn & Suites Stillwater-University West – rated 8.4 by recent guests! The location was perfect, the staff was friendly and the room was cozy! Sara, at the front desk is wonderful. Its always clean and nice here. Very friendly clean place and staff was exceptional. The bartender was very nice and friendly. Enjoyed our stay. The lobby was inviting, the elevator was fast and spacious. The staff was very friendly and helpful. The workout facility was decent size and had what I was expecting, in the way of exercise equipment. I also liked the restaurant, it was very convenient. The Front desk worker, Jacquline was very sweet and helpful. Great bed. Very cool that there is a restaurant and bar there. I believe it may be the only hotel in town that has this feature. (Besides the student union hotel). Lovely stay. Holiday Inn & Suites Stillwater-University West This rating is a reflection of how the property compares to the industry standard when it comes to price, facilities and services available. It's based on a self-evaluation by the property. Use this rating to help choose your stay! This hotel is located in Stillwater, 3 miles from Oklahoma State University. The hotel offers an outdoor pool with hot tub, gym and rooms with flat-screen TVs. 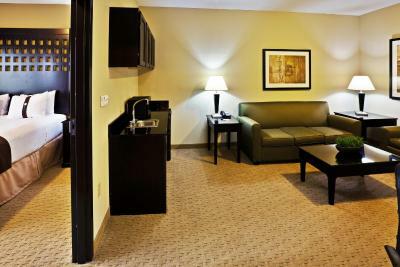 Guestrooms at the Holiday Inn & Suites Stillwater-University West are equipped with a microwave and refrigerator. The rooms feature modern dark wood furniture. The rooms also have access to free Wi-Fi. Guests at the Holiday Inn & Suites Stillwater can dine in the West End Restaurant. The hotel also has barbecue facilities. The Holiday Inn and Suites is 3 miles from the National Wrestling Hall of Fame Museum. The Cimarron Casino is 10 miles from the hotel. When would you like to stay at Holiday Inn & Suites Stillwater-University West? This suite features a separate bedroom and living area with a sofa bed. This suite has a seating area, tea/coffee maker and microwave. This suite has a kitchenette and living area with a sofa bed. This corner suite features a separate living area with a sofa bed. An accessible tub is available in this room. A roll-in shower is available in this accessible room. 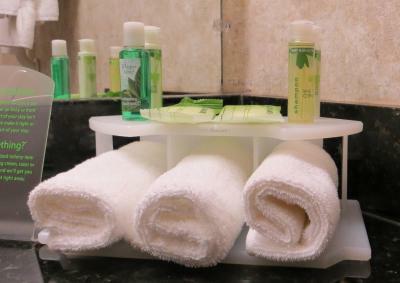 House Rules Holiday Inn & Suites Stillwater-University West takes special requests – add in the next step! Holiday Inn &amp; Suites Stillwater-University West accepts these cards and reserves the right to temporarily hold an amount prior to arrival. Holiday Inn & Suites Stillwater-University West accepts these cards and reserves the right to temporarily hold an amount prior to arrival. The cleanliness of the restroom needed attention The door was very dirty. It is a wonderful hotel and have stayed her several times. Only problem at all is temp control. Every time one room is fine and the bedroom and bathroom are freezing. I had booked with booking .com when we got there the hotel staff asked if we were with HIE that we would get a better deal. So they switch us over. When we got to the room one of the beds had a small spot of what appeared to be blood on it. The coffee pot didn’t work. I called down and asked for a replacement. Over an hour later I went down to the lobby and asked for a cup of coffee. The staff apologized stating that a new guest had come and immediately exchanged our coffee pot and gave us extra coffee pods. I was under the impression that breakfast was included with our stay. Turns out it wasn’t. Our bed was a little worn out and I tended to roll to the middle of the bed. There was only one comfy chair in the room, it would have been nice to have had two. Also, there was no light near the chair, so it mad it difficult to read when sitting in the chair. My wife and I both like to relax in the evening with a book, but the light was insufficient.